Perfect summer soap treat! Fun and refreshing! This will make a great summer craft to do with your kids! INCI Ingredient Label: Propylene Glycol, Sorbitol, Water, Sodium Stearate, Sodium Laureth Sulfate, Sodium Myristate, Sodium Cocoyl Isethionate, Triethanolamine, Glycerin, Fragrance, Fragaria Vesca (Strawberry) Seed, Papaver Orientale (Poppy) Seed, Mica (and) Titanium Dixoide (and) Red 40 Lake (and) Hydrogenated Polyisobutene (and) Palmitic Acid (and) Phenoxyethanol (and) Benzoic Acid, Blue 1 Lake (and) Yellow 5 Lake. Measure 5 oz. of Extra Clear Soap and cut into small pieces. Place in glass measuring cup and heat in microwave until melted. Add 4 ml of fragrance oil and mix. Add Coral Mica Powder until desired shade is reached. Add 1/4 teaspoon Poppy Seeds and blend into clear soap. Pour between 4 of the heart shaped cavities. Spritz tops with alcohol to release any air bubbles. Measure and melt 1 oz. of Ultra White Soap in a plastic beaker. Add 1/8-1/4 tsp. Matte White Pigment and mix in well. Add 0.75 ml of fragrance oil and blend in. In a "V-shape" pour a small amount of white soap in the heart shaped cavities with pink soap. There should be enough white soap left to do this same technique for the "kiwi slices". White soap should be poured before pink soap hardens. Measure and melt 4.5 oz. of Extra Clear until melted. Remove from microwave and stir when completely melted. To melted soap add 4 ml fragrance oil. Add green and yellow mica powder until desired shade of green is achieved. Add 1/2 teaspoon of Poppy Seeds. Stir soap well. Pour into 3 of the round soap mold cavities. Spritz tops of soap with alcohol. Remelt the remaining white soap in the plastic beaker. In the center of the round green soap cavities, pour a small amount of white soap in the same "V-shaped" technique as in Step 8. Spritz with alcohol. Measure and melt 4.5 oz. of Extra Clear Soap in a glass measuring cup. Add 4 ml fragrance and Coral and Yellow Mica Powder. Mix and then pour between 3 of the round cavities. Spritz with alcohol. Allow all pieces to set up before unmolding. Unmold the fruit pieces and cut into fruit shapes. For the kiwis, cut each piece into either 2 or 3 slices, leaving them in the round shape. For the strawberries, cut off the tops of the hearts and then cut them into 2-3 slices each. For the peach slices, cut them in half to create semi-circles and then cut those pieces in half. Each round soap should make 4 half-circle shapes. Experiment to see how many pieces of fruit you want in each cavity. Remove the pieces from the cavities until you are ready to pour the clear soap. Any extra fruit slices can be stored in an air-tight container for future use. Weigh 24 oz. of Extra Clear soap base. Cut up into chunks and place in large glass measuring cup. Heat in microwave until completely melted. Add 22 ml of fragrance and gently mix in. Spritz the fruit pieces for the first soap pop generously with alcohol and place in the mold cavity. 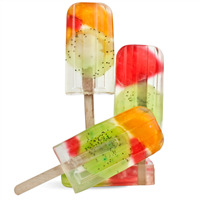 Check temperature of clear soap to be sure it is at or below 125° F. If it is too hot, the fruit slices with melt. Pour clear soap around the fruit slices and spritz the top with alcohol. Take fruit slices for next soap pop, spritz generously with alcohol and place in soap cavity. 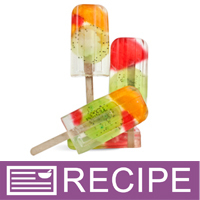 Pour clear soap over these fruit slices and spritz top with alcohol. Continue in this manner until all soap pops have been made. Place the lid for the mold over the top and place the soap pop sticks in each bar of soap. Try to position the stick in between the fruit slices so the stick does not cover them up. Allow to completely set up before unmolding. DO NOT GRAB STICK TO REMOVE FROM MOLD. Gently press on bottom of soap cavity until you can see the soap release from the sides of mold. Then gently push soap up and out of cavity. Label product accordingly. Be sure to add to label “DO NOT EAT. REMOVE STICK BEFORE USING”.